The Brandon Blackhawks football team is off to a 6-1 start for the second time in three years and with last week’s convincing 56-27 win over rival Linden the Blackhawks have clinched a trip to the MHSAA Football Playoffs for the fourth consecutive season! The Blackhawks have two regular season games left on the schedule including a week 8 trip to Holly for our annual game with our cross town rivals and a week 9 home game versus Swartz Creek that with a win could bring the Blackhawks their first ever Flint Metro League championship. The boys are excited for the challenges that lay ahead as they prepare each week for their opponents. The first seven weeks of the season have been very exciting to this point. The Blackhawks kicked off the 2018 campaign with a huge 26-21 victory over the seven time consecutive league champions Fenton at historic Atwood Stadium as part of the week 1 Flint Vehicle City Gridiron Classic. 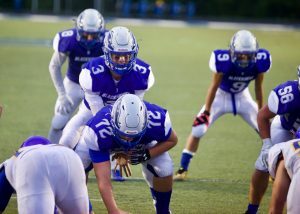 The Blackhawks Offense produced over 400 yards in the contest highlighted by Mike Nicaj’s 172 yards of total offense and three touchdowns, Adrien Williams pounded the Fenton defense for 112 yards on 27 carries, and QB Mathew Harrison making his first varsity start threw for 216 yards and 2 touchdowns. The defense held Fenton to seven second half points spearheaded by Mike Nicaj’s game high 8 tackles including one sack, a forced fumble, and a fumble recovery. The loss for Fenton was their first regular season loss in the Flint Metro League since week one of the 2012 season. 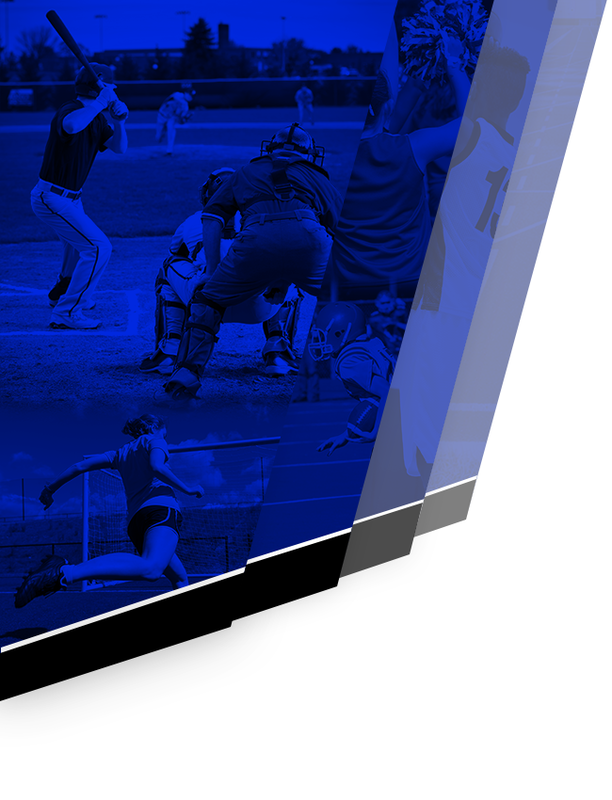 The Fenton Tigers went on to win 5 straight games after losing to Brandon. In week two the “Battle for M15” rivalry with our neighbors to the north was renewed as Goodrich came to Brandon looking to reclaim the Milk Jug Trophy which has not left Brandon since 2015. The Blackhawks weren’t having it though as they dominated the Martians from start to finish with a commanding 26-7 victory. The offense once again hit the 400 yard mark being highlighted by 350 yards on the ground. Adrien Williams once again pounded the opponent’s defense tallying 132 yards and 1 touchdown on 33 carries while Mike Nicaj continued to light up the scoreboard putting up three more touchdowns while rushing for 111 yards. The Blackhawk defense lead by senior Captain Jake Irwin and his 8 tackles held the Martians to just one first half touchdown and shut down an offense that is averaging 36 points a game in their other contests. This game was also a special night for our community as we rose over $5,000 for a scholarship fund honoring our local fallen hero Deputy Eric Overall of the Oakland County Sheriff’s office who was killed in duty last Thanksgiving protecting our community. Both teams wore custom jerseys representing our local law enforcement communities and our local first responders were recognized in a pre-game ceremony. At half-time Deputy Overall’s wife and son were presented with their own custom “Never Quit” jerseys. It was certainly a night to remember. The Blackhawks got to 3-0 with a league victory over a young and talented Flint Kearsley squad defeating the visiting Hornets 42-28. The ground game for the Blackhawks continued to dominate accounting for 443 of the Blackhawks 481 yards of total offense. Mike Nicaj lead the rushing attack with 148 yards and a score on 14 carries. Jake Irwin reached the century mark as well carrying the ball 21 times for 117 yards. Quarterback Mathew Harrison ran for two scores and passed for one more in another fine performance from the position. The defense adjusted at halftime and limited the potent Hornet offense to just one second half touchdown. Irwin and Nicaj again lead the defense with 11 and 10 tackles respectively. The defense also saw solid play from junior defensive back Brendan McCluskey who chipped in 9 tackles. Week four saw the Blackhawks stumble for the first time as the host Flushing Raiders and their triple option offense defeated the Blackhawks 59-39. The offense did their part to keep the Blackhawks in the game as once again the unit produced another 400 yard day. The Blackhawks ran for 251 yards and passed for another 158 on the day. Mike Nicaj continued to tear up the Metro League with 110 yards on the ground and 4 more rushing touchdowns. Mathew Harrison threw for 150 yards including a pair of touchdowns to senior wide out Justin Bowman. Flushing has been on a 4 game win streak since defeating the Blackhawks. Weeks five, six, and seven saw the Blackhawks kick it back into high gear winning three games in a row defeating Owosso 53-29, Clio 56-6, and Linden 56-27. A week 5 trip to Owosso saw a determined and disciplined team jump out to a 33-7 advantage and never look back! The offense put up a season high 605 yards behind the leadership of senior signal caller Mathew Harrison. Mathew threw for 220 yards and two touchdowns. The ground game continued to dominate rolling up 376 yards lead again by Mike Nicaj’s 160 yard performance scoring two more touchdowns. Justin Bowman caught 4 passes for 85 yards and two touchdowns. Senior Matt Hill also scored his first varsity touchdown switching from tackle to running back for a 4 yard scoring run. The defense was led by Mike Nicaj’s 10 tackle 1 interception night. Clio came to Brandon for our annual Homecoming game and neither the visiting Mustangs nor the pouring rain could slow down the Blackhawks. The 56-6 effort was led by a balanced attack that once again saw the offense eclipse the 400 yard mark. Mathew Harrison threw for 156 yards and 1 TD. Mike Nicaj kicked in 102 yards of all purpose offense and another touchdown to his season tally. Jake Irwin scored his first two touchdowns of the season and senior receiver Devin Krause caught two passes for 75 yards and a score. Freshman QB Micah Miller took the reins of the offense in the second half and led the Blackhawks on two scoring drives on both second half possessions. The defense took care of business almost posting a shutout as Clio managed to sneak a touchdown past the Blackhawks on the game’s final play. Mike Nicaj’s 10 tackle 2 sack performance once again led the Brandon defense. 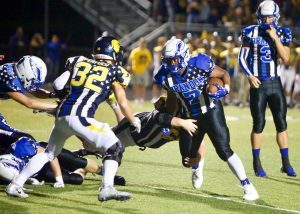 Week seven was a revenge week for the soaring Blackhawks as they avenged two 2017 losses to the Linden Eagles with the 56-27 win. The offense put up 469 yards of offense with 425 coming on the ground! 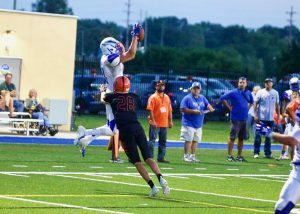 Two Brandon backs eclipsed the century mark as Mike Nicaj rolled up 181 yards on 17 carries and three more touchdowns while Jake Irwin racked up 119 yards and a score on the night. Quarterback Mathew Harrison used his legs more than his arms this night with two rushing touchdowns of his own and 54 yards on the ground. The defense shut the Eagles out in the first quarter and the fourth quarter while applying heavy pressure all night. Irwin and Nicaj kicked in 8 tackles each on defense, sophomore linebacker Alex Griffiths made his second consecutive start and picked up two sacks on the night, and the Blackhawks secondary picked off three Linden passes. Devin Krause had two interceptions and Brendan McCluskey recorded the third pick of the night. The Blackhawks are averaging 42.5 points a game this season and have racked up just over 3200 yards of total offense including 2258 yards on the ground. Leading the Blackhawks offense is quarterback Mathew Harrison who has thrown for 882 yards and 9 touchdowns while rushing for another 200 yards and 4 touchdowns. Running back Mike Nicaj has been ripping up the Flint Metro this season carrying the ball 89 times for 822 yards and 17 touchdowns. Jake Irwin has posted 500 yards on the ground and Adrien Willams has bulldozed his way to 410 yards. Justin Bowman has led the receiving corps with 13 catches for 281 yards and 7 touchdowns. Junior Brendan McCluskey has proven to be a jack of all trades kicking in 570 yards of all purpose yards and scoring four touchdowns on the season so far. The offensive production has been made possible in large part to an offensive line that is working very hard and grinding it out every week. The offensive line is led by seniors Matt Hill, Cooper Hickmott, and Ryan Coughlin as well as junior Josh Dubiel, sophomore Colton Leslie, and freshman Gino Trubuzio. The offensive line was even featured on the front page of the Oakland Press after our victory over Clio. The Blackhawks aggressive defense for the third straight year is being lead by senior linebackers Mike Nicaj and Jake Irwin. Nicaj has 61 tackles, 4 sacks, 1 interception, and 1 fumble recovery through seven games. Irwin has 58 tackles and two sacks. The defense has also seen major contributions this year from Brendan McCluskey, Matt Hill, Adam Rowe, Peyton Gulledge, Brandon Gunn, Jordan Elkins, Devin Krause, Alex Griffiths, and Jacob Turner. The Blackhawks special teams units are having a solid season as well. Sophomore place kicker Ian Burke has connected on 16 straight extra points, Cooper Hickmott has done a great job placing kickoffs, and Brandon Gunn and Brendan McCluskey have given the Blackhawks good field position on several key returns. The Blackhawks would love to see the whole community out the next two weeks at Holly on 10/12 and home against Swartz Creek on 10/19. Let’s pack the stands in Brandon Blue!!! Playoff pairings will be announced on Fox Sports Detroit at 7:00 on 10/21! Our first playoff game will be on 10/28.